My Weekend column on Saturday was all about kids, obesity and the use of the word ‘fat’. Oh, and those McDonalds Happy Meals. I’ve stuck the column on my Citizen column page here so you can have a read. You can also catch my columns each week on the NEW Citizen and Echo Weekend website. My Weekend column on Saturday was all about holidays and how, at the grand age of 39, I have learnt to be an utter numpty. In a way. I’ve stuck the column on my Citizen column page here so you can have a read. My Weekend column on Saturday was all about holidays and how, in this time of economic turmoil and excessive work, we all need to go and have one huge rest. I’ve stuck the column on my Citizen column page here so you can have a read. Cream crackered? Or no time and money for a break? Let me know. My Weekend column on Saturday was all about roller coasters and how, in life as on roller coasters, we really have to open our eyes and take a look around. I’ve stuck the column on my Citizen column page here so you can have a read. Roller coaster lover or not? Do you think we need to open our eyes to things a bit more or is there simply too much going on? Let me know. My Weekend column on Saturday was all about jeans and how, the design and purchasing of them not only squeezes your unmentionables, but your sanity, too. I’ve stuck the column on my Citizen column page here so you can have a read. Your thoughts on the utter hell that is jeans? Let me know. My Weekend column on Saturday was all about Women’s Football and, specifically, the new BBC TV show of it that was aired last month and how, despite my tomboy genes, I have a dismayed heart. I’ve stuck the column on my Citizen column page here so you can have a read. 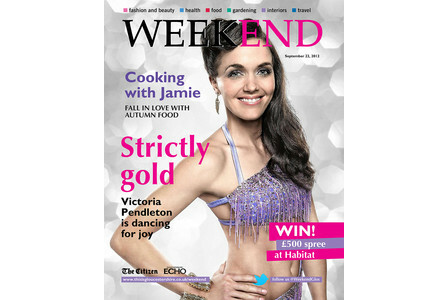 You can also catch me each week on the Citizen and Echo Weekend magazine website. There’s lots of other weekend stuff on there, too. Your thoughts on the airing of Women’s Footie? Let me know. My Weekend column on Saturday was all about PDAs – public displays of affection – and how, for me, it’s just a snog too far. I’ve stuck the column on my Citizen column page here so you can have a read. PDA or not? Which side are you on? Let me know. My Weekend column on Saturday was all about Miss.Piggy and how, as an icon of my childhood, she is the true feminism hero. I’ve stuck the column on my Citizen column page here so you can have a read. Miss.Piggy – a feminist hero or not? Who’s your hero? Let me know.